In the very near future, Mozilla will be shipping a browser that lacks basic customization and has serious issues in it's theme-ability. Many themers have already given up on even supporting the most basic types of themes. I have for some time thought that Mozilla could change their builds to implement a "basic" theme which would be easy to build and difficult for Mozilla to break in updates. Neither of these seems likely. We've also seen over and over again that even the "lite" themes many of us have built using basic !important tags are breaking. The problem is of course that the Firefox developers are constantly tweaking the default theme in weird ways. There is also a severe lack of even uninteresting themes available for Sea Monkey. 1. a chrome.manifest that sets up a secondary skin mirroring browser and navigator skins in Firefox and SeaMonkey. 2. a series of overrides in the manifest that replaces browser.css and navigator.css (and other files) respectively. 3. an xul overlay for Firefox that restores the independent back, forward, stop and reload buttons, and reduces the urlbar to it's current state (as well as provide missing buttons for SeaMonkey). 4. "dummy" versions of browser.css and navigator.css sitting in our new skins, which contain the boring parts of those files in the default theme. 5. a "mini" theme which connects to either browser.css or navigator.css (based on the manifest) which styles the fun bits. 6. the required images also sitting in our new skins. With such a system running, all a theme would be required to do is provide images and provide the "fun" parts of the theme, with a manifest pointing to our "basic" skin. You wouldn't even need a special manifest flag to support SeaMonkey, because it's all universal. The owner/developer of the extension would have to be responsible for making sure that the default theme bits continue to work properly... but unlike the REAL default theme, it wouldn't HAVE to carry every change Mozilla makes. Oh, and the "baseline" theme that this would deliver would be something similar to the current SeaMonkey or old Firefox 2.0 theme: nothing fancy. Basic toolbox, toolbars, toolbarbuttons, urlbar, searchbar, and tab styles... that's it. Comparing Firefox with SeaMonkey, they currently share many identical node names, which means a really well-rounded theme could easily style both. /newskin/ = contains your agnostic universal newskin.css file with only the fun bits. /firefox/ = contains your edited browser.css file based on the default theme with the fun bits taken out. /seamonkey/ = contains your edited navigator.css file based on the default theme with the fun bits taken out. You can do this same process with as many files and window overlays as your want to. The code in newskin.css will *not* require !important tags because it is applying to the overlays exactly the same as any major theme CSS file does, and because we've *removed* the conflicting bits from browser.css and navigator.css. This builds the platform. Now you can create a basic theme using only the newskin skin package and the newskin.css (and support images) and it will work just like a regular old theme. Ya... just a little bit. I can't even wrap my head around Australis. 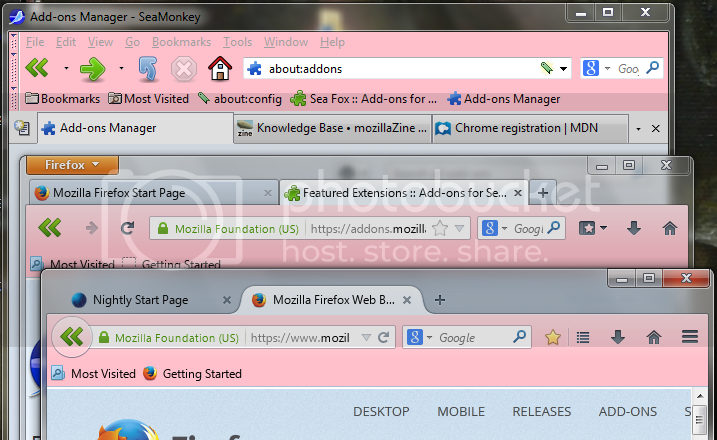 I am dreading FF28 and your mind is wandering off onto how to support Firefox and Sea Monkey in a single theme? If anyone could pull this off, it would be you. I'm just praying I can figure out how to support FF28 without losing my mind. Well, I don't think any of this really applies to Australis... since it appears to be breaking extensions as well as themes in pretty extreme ways. This is more like the "light" theming platform that Mozilla (or one of us) should have built 4 years ago instead of Personas. More of a hypothetical thought experiment for an alternative reality where Mozilla isn't hell bent on breaking every feature that made Firefox the beloved web browser of choice. So every time there is a major change to browser.css or navigator.css (in areas outside of our basic theme!) that would require a new /versions support/ to be built for each supported OS. The fortunate thing is I honestly don't think such support would require much testing. Unpacking the files from the FTP and editing the bits out of browser.css that impact our basic theme should be sufficient to maintain compatibility for a long time to come. I feel like it's also important to mention that no matter how large and ungainly the install is for the extension due to copious os/version support folders, that the chrome.manifest will only be loading ONE browser.css or navigator.css file into memory, which replaces the one in the default theme, so there should be NO net gain in overhead!!! !